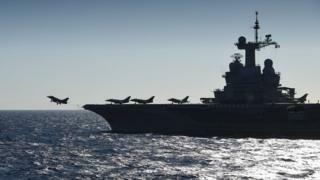 France has begun air operations over Iraq from the aircraft carrier Charles de Gaulle, reports say. A number of Rafale fighter planes took off from the carrier early on Friday, news agency AFP said. The Charles de Gaulle, France's only aircraft carrier, was sent to the region earlier in September. This is its third mission with the US-led coalition since France stepped up military operations after the January 2015 Paris attacks. Iraqi forces have gained significant ground in the battle for Mosul, which was occupied by IS in June 2014, and are expected to launch an offensive to retake the city soon. AFP quoted an officer on board, who said the planes would take part in an attack on Mosul, an IS stronghold in Iraq. However, a French defence official told the Associated Press that Friday's mission was "in no way" the start of a battle for Mosul. He said the ministry would not provide details of the operation for the security reasons. French radio station RTL reported (in French) that 24 aircraft will take part in today's operation, with a sortie every three minutes, on average. It also said the fighters were armed with four 250kg laser-guided bombs each. The Charles de Gaulle is a 38,000-tonne ship powered by two nuclear reactors. It has more than 1,900 crew, and is 260 metres (850ft) long.